A commonly discussed topic of course when you are a landlord - rent arrears. For some it's a dreaded time of the month, that time when you sneak at your online banking to see if the tenants have actually paid you... It won't be trouble 99% of the time of course as you use a reputable agent with stringent referencing criteria to help you find the best tenant. But there's always that 1%...! It is entirely possible that the successful marketing manager has found themselves in troubled times and can't find enough income after going it alone, or was let go from their job without finding a suitable replacement. Circumstances change of course, but one thing that doesn't change is the contractual obligation to pay rent on a given day of the month. They may, however, have more pressing priorities like food - knowing that they can't just walk out of the shop without paying for their weekly shop. They can short change you on the rent a lot easier! So arrears do happen - how should you deal with it? 1. Speak to them. There may be an entirely innocent reason for them not paying. Changed bank accounts, just went a bit overdrawn, didn't realise, etc, etc. Easy to solve. 2. If the above doesn't lead to prompt payment, and I mean payment within 24hrs, then I would expect it was an excuse. Be prepared for a lot more. Make sure that you have enough funds to cover your own BTL mortgage payments however, because you don't want their shenanigans to negatively affect your ability to get other loans and things. This will prohibit your property investing that's for sure! 3. They haven't paid within 48hrs and now it's time it's time to get serious. Most tenancy agreements will have a clause in there that says you as the landlord will be allowed to charge them an admin fee for writing them a reminder letter. Normally this ranges from £25-£50. Believe me this isn't about the money, this is more about making a full report on the methods you have used in order to ensure they know that rent is formally (over)due. Note there is a time period specified, so you can't charge them £50 if it's a day late, normally this is 3-7 days. Not a money spinner, just for reporting purposes and to cover your time and effort. 4. Letter has gone out, excuses still forthcoming quicker and faster than an incoming tsunami. No money. So there's two issues really. 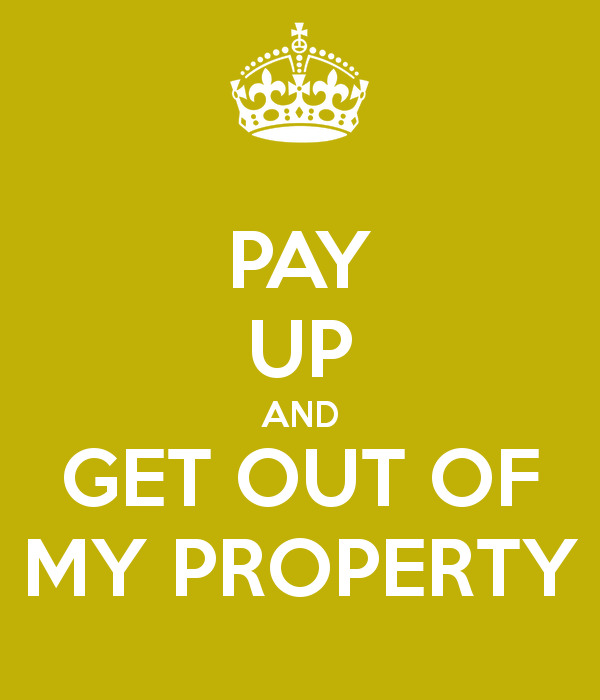 The first is that you want payment and the second is that you probably want to evict your tenant(s). Possession and arrears. We can't sue them for arrears as we don't know how much they owe until they leave, so let's get them out first. Now it's time to look at where we are in the tenancy. For the sake of ease, I will assume that the tenancy was set up properly and all was done by the book, ie deposit registered, right to rent checks carried out, EPC and GSC given to the tenant at the start of the tenancy and so forth. If you haven't, well, naughty naughty first of all, and secondly you'll have a real problem getting them out! Now - if you have granted a 12 month AST and this happens to be happening around the last 2 months or so of the tenancy then you can serve what's known as a Section 21 notice (you can contact me for more specifics if you like, there are some variations here) and the tenancy will come to an end. If it's NOT near the end of the tenancy you will have to get possession under various grounds of the housing act, normally 8,10 and 11 (google these for full explanations, but in a nutshell it comes down to irregular payments, history of late payments and 2 months of arrears). The last is key, because it's a mandatory ground. Tenants can sometimes know this and pay off £1 towards their debt if the case goes to hearing and they have exactly 2 months' arrears and then you can't get a possession order. A common misconception is that you have to wait two months, but this is wrong - you have to wait until they are 2 months in arrears, which is effectively only 31 days (longest) after they missed the first payment (this will soften the blow somewhat). So you can apply for a hearing and so forth, I'll spare you the technical form filling. 5. Arrears and possession - you can apply for APP, accelerated possession proceedings, this will get you a possession hearing quicker but NOT deal with the arrears. Now a lot of landlords leave it there and simply let the tenant fly off, leaving arrears and often damages behind them. Often times I hear "well they'll never pay anyway, what's the point?" I am very keen for you NOT to let this slide. If nothing else, you want the next landlord to be forewarned of their behaviour. Nothing says "don't rent to this person" like a CCJ! So how do you do it? You'll need an address for the tenant. If you have just come home from your APP hearing and won, get straight on to MoneyClaim OnLine and launch a claim against your tenant at the property address (part of the success is that it has to be a current address, doesn't matter if they are about to move). So you will no doubt get a judgment. Whether they defend the claim or whether you get what's known as a "judgment by default" (where they don't defend it), you now have a CCJ against the tenant. So when they apply for anything with credit and a credit check is involved, they will have to disclose their previous addresses. And guess what, they won't be able to do anything until your arrears (your judgment) have been paid off. A win in my books. It's not a guarantee of success of course, they may, in extreme circumstances, declare themselves bankrupt or leave the country. But if they are after credit again they can't leave the CCJ unsatisfied, that's for sure. And you've just done a fellow landlord a big favour by putting a black mark on their file. So no excuses of "it's too difficult" and "oh I need an expensive solicitor" and "I can't be bothered." With the average rent in Clapham being around £1700pcm two months' arrears quickly adds up. You can charge interest too, you know! For £185 fee for any claim between £3000 and £5000 it seems unwise not to invest it. If you don't put that claim on their credit file you'll definitely never see the money back, are you? Do you have tricky tenants? Do you have arrears? Do you want to know more about the next steps to take? Drop me a quick line on jeroen@claphampropertyblog.com or better yet, why don't you pop by and see me later this month at the Clapham Property Meet, the networking hub for landlords and investors for Clapham and surrounds.